Marchesa Brigida Spinola Doria was a young Genoese from one of the leading patrician families, recently married and 22 years old at the time the work was completed. The imposing setting and the marchesa’s stately appearance leave little doubt that she is a person of wealth and status. The direction of her gaze and the perspective of the architecture indicate that the painting was meant to be hung high—significantly above the viewer. The lady’s head emerges like a lotus from the center of an elegant, platter-like ruff. Glowing satin, lace, and jewels set off her pinkened and powdered face, accentuated by a flowing red drapery and an elaborate hair ornament that crowns her carefully curled locks. The rich tones of the marble and stone edifice before which she stands, likely her family palazzo, add to the sense of limitless luxury. However refined her accoutrements may be, Rubens made his subject personable with an emergent smile and enormous, keen brown eyes. The marchesa’s self-possession also may have been engendered by the unusual freedoms upper-class women in Genoa enjoyed. Pope Pius II, while still a youthful secretary to a cardinal, commented that the city was a “paradise for women." 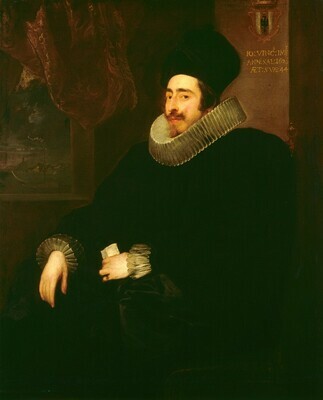 Originally, the picture was even grander: a full-length portrait with a view into the distant landscape at the left. This made it more apparent that the setting is outdoors, on a terrace. A drawing of the painting (Pierpont Morgan Library, New York) records its earlier appearance. During the 19th century, the canvas was cut down to its present state. The Spinola family, major art patrons in Genoa, derived their affluence from mercantile and banking enterprises. It was commonplace for families of means to consolidate their wealth through intermarriage—Brigida Spinola married her cousin Giacomo Massimiliano Doria in 1605. She became a widow in 1613 and later married Giovanni Vincenzo Imperiale, a senator of the Genoese republic who was also devoted to poetry and art collecting. 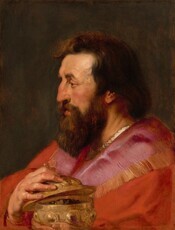 Imperiale’s portrait by Rubens protégé Anthony van Dyck is also in the National Gallery of Art collection. 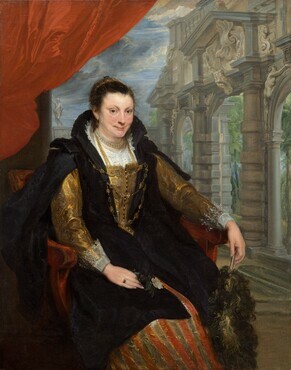 Marchesa Brigida Spinola Doria also inspired Van Dyck’s portrait of another Genoese noblewoman, Marchesa Elena Grimaldi Cattaneo, another Gallery collection highlight. 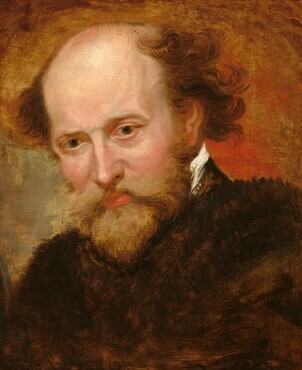 Among most prolific, learned, and versatile painters of his day, Rubens was also famous as a courtier and diplomat, whose legendary tact and cultivation earned him the respect of royal courts across Europe. 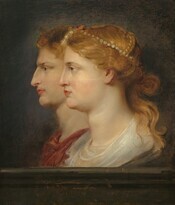 Rubens was born in Westphalia, Germany. His father Jan, a Calvinist, had moved his family there from their native Antwerp, a Catholic stronghold. 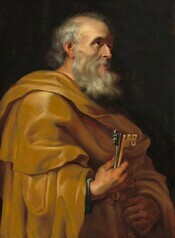 Jan died when Rubens was nine, and his mother, Maria Pipelinckx, moved the family back to Antwerp, where they converted to Catholicism. There, Rubens received the finest classical education available. As a teenager, he was sent to the court at Brussels, where he was schooled in social graces and the ways of the aristocracy. 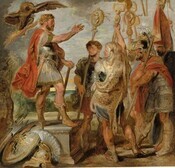 Rubens learned Dutch, German, French, and read Latin (later adding English and Italian). He took up drawing, initially copying the works of famous artists. As his talent became evident, Rubens began formal training as an apprentice in several painters’ studios. Sweeping biblical scenes, mythological dramas, and portraits were favored subjects from the outset of his career. 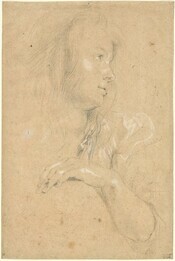 Rubens completed his art education with a visit to Italy, where he remained from 1600-1608. He studied Renaissance painters in Venice, and also lived in Mantua, Rome, and Genoa. With letters of introduction to the Italian nobility, he was able to secure important commissions, painting portraits and works for private chapels and churches. He left Italy to attend to his dying mother in Antwerp and never returned. 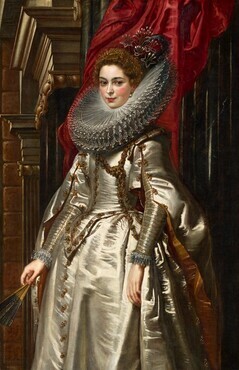 Back in northern Europe, Rubens became court painter to Archduke Albert and Archduchess Isabella. He established a large and prosperous studio in Antwerp undertaking numerous commissions to adorn churches whose artworks had been destroyed during the Protestant iconoclasm. His patrons allowed him to accept commissions from foreign courts, including that of Maria de’ Medici of France, as well as nobles in Spain, Germany and England. He married Isabella Brant in 1609 and he bought a house in 1610 that he transformed into an Italianate palace which he declared a “temple of art” (and can be visited today as a museum). 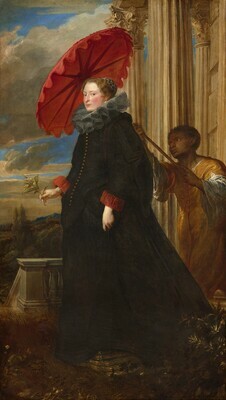 Rubens trained other painters, among them, Anthony van Dyck, a Flemish compatriot who painted a portrait of Rubens’ wife, Isabella Brant. 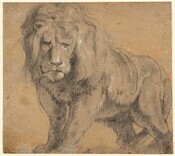 In addition to painting, Rubens was a printmaker and designer of tapestries. For his diplomatic role mediating between Spain and England as well as artistic achievements, he was knighted by King Charles I. 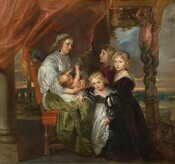 Several years after the passing of his beloved Isabella Brant in 1626, Rubens married Hélène Fourment, 15-year-old daughter of an Antwerp tapestry merchant, with whom he fathered additional children. The two eventually retired from public life to a country estate, where he painted a number of landscapes. Rubens died in 1640 and is interred in the Church of Saint Jacques in Antwerp.